Veteran Sanibel Sea School camper Brenna Cohen recently earned her Girl Scout Gold Award. 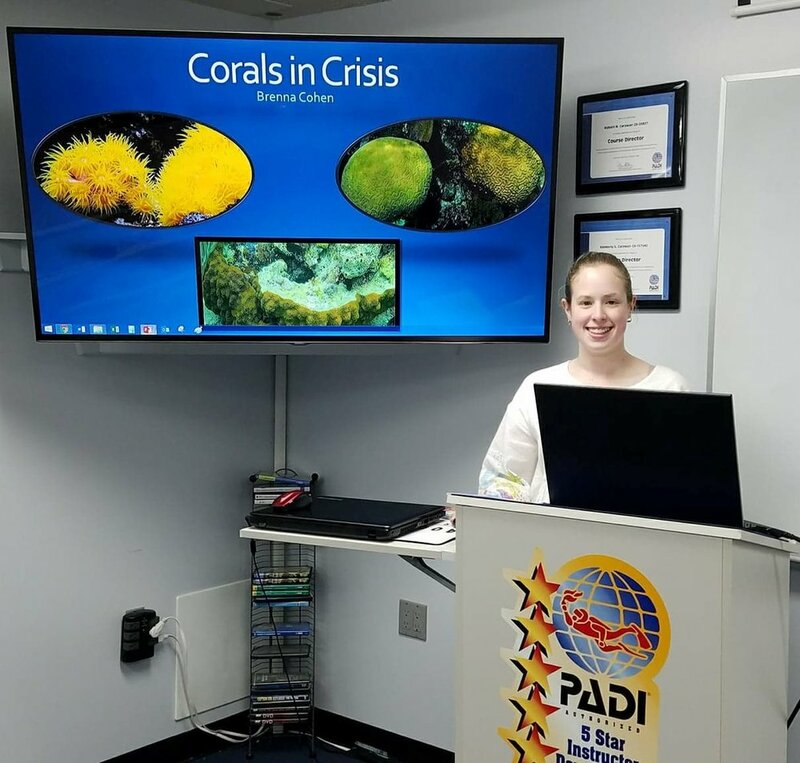 For her project, she designed a two part workshop to educate kids about coral reef conservation and give them a chance to experience what it’s like to work in coral reef research and restoration. We interviewed her about the experience, including the challenges and rewards, and how the average citizen can help protect coral reefs. Brenna Cohen taught workshop participants about coral reefs, their global importance, and the threats they are currently facing. Tell us about your project in a few sentences. This project was for my girl scout Gold Award, the highest award a girl scout can earn, similar to an Eagle Award for boy scouts. I wanted to spread awareness of what is happening to coral reefs and what we can do to help. I developed a lesson plan and an activity for kids, then created a two part workshop. On land, kids would participate in my short presentation and then practice building a coral reef tree, including knot tying. The second part of my workshop consisted of diving into the water with a SCUBA dive master, learning basic SCUBA skills, and re-building the coral trees there. I also built a website to house my presentation along with other resources that I gathered during my research. I knew I wanted to do something unique for my Gold Award and while looking over previous projects, I realized that there weren’t many educational projects. I made a list of current events that I was interested in and as soon as I wrote down “coral reef decline” on my list, I couldn’t see myself doing any other topic. Why are you passionate about coral reef conservation? I love scuba diving. To me, it is like entering a completely different world. When you think of the ocean, you think of the moving animals such as the whales or the sharks or the giant schools of fish. Coral doesn’t immediately come to mind, but it should. Most marine life is connected to coral reefs in some way. And it’s not just marine life that benefits from reefs, humans do too. We can create medicine from certain snails that live on reefs, and our economy includes tourism and fishing industries that rely on the coral reefs for income. Coral reefs also protect shorelines from erosion. If the coral reefs die, humans will be hit hard by the loss, and I don’t want that to become a reality. Workshop participants learned the basics of scuba diving and built PVC coral trees, which are widely used in coral reef restoration projects. Who did your project serve? What feedback did you receive from participants? My workshops targeted kids who were between the ages of 8-12 years old. The participants enjoyed my workshops very much and one little girl even sent me a personal thank you note. The kids really found the SCUBA inspiring. Throughout the workshop advertising process, I was asked questions about whether teenagers were allowed to attend or if there was going to be a teen workshop. Also, parents had commented that they were interested in an adult workshop. The website is public, so that portion of my project serves anyone with an internet connection! So far it has recorded over a thousand visits. The most challenging aspect of the project was scheduling. It was difficult to coordinate the timing with the host dive centers. Also, the kids had never been SCUBA diving or breathed underwater before, so getting them to focus on building the coral trees had to wait until the newness of the experience wore off a little bit. After the first workshop, I did cut the size of the PVC coral trees in half to better accommodate the stature of the students. One other challenge was that Atlanta is not a coastal city, so many of the students had never been to a beach much less seen a coral reef in the wild. It was important to explain to them how coral reefs impact everyone on the planet. The most rewarding part was getting to see the kids’ faces lighting up underwater as they built the coral reef trees. To know that I inspired young kids to join the conservation effort was so satisfying. It also felt good to get more girls interested in possible STEM careers. What would you suggest to someone who is looking for simple ways to help protect the future of coral reefs? You can help coral reefs by picking up trash to prevent it from ending up in the ocean. When diving or swimming near reefs, use coral reef safe sunscreen and be mindful to not kick or break parts of the coral. Boaters need to be very aware of appropriate methods for anchoring on or near coral reefs. When diving, you can also pick up trash from around a reef, just as you can when walking on a beach; but be sure to check for marine life before taking the trash, some animals like octopus like to recycle bottles as their homes! Do you think you will continue to participate in research and/or education related to coral reefs? I am always on the look out for interesting articles and videos related to coral reefs. I add them to a gallery of other sources on the website I built. I look forward to one day diving with the Coral Restoration Foundation to build coral tree farms and help with transplanting corals. If you’d like to know more, go check out my website at www.coralsincrisis.com, and don’t forget to share with your friends!